Were you a victim of that email that was going around a year or so ago? When you opened the email. . . splat! A snowball would explode on your screen. Well, have no fear. I'd much rather eat snowballs than throw them! Since much of the country is stuck inside the house with their children due to the frightful weather we're having, I thought an easy, fun and yummy recipe might be in order. Beat butter, sugar and vanilla until combined. Add flour and nuts. Beat well. Shape dough into small round balls. Place on ungreased baking sheet. Bake at 325 degrees for 12-15 minutes. Remove and dip into powdered sugar. Re-dip in powdered sugar when cool, if necessary. I want to share with you some scenes from my friend's Christmas tree. It's a beautiful tree, boasting over 700 ornaments. If we're comparing ourselves to Christmas trees, I want to be just like this one: warm, bright and joyful! That's what our Pastor was doing yesterday; comparing us to Christmas trees. I thought I'd share a few of his points with you. Like the Christmas tree, we are picked (and placed). Like us, the tree does not have the ability to purchase itself. Through it all, He decorates us with the fruits of the Spirit. Love, joy, peace, forbearance, kindness, goodness, faithfulness, gentleness and self-control. Even more, He gives us gifts. Not only to keep, but to give to others who pass by. The star is His word, the light unto our path. And angels hover above, ministering and watching over us. There is one difference between us and the Christmas tree, though. The tree doesn't have any say in the matter. We do. Stand tall and let Him do His work. And when you're done kneeling at the manger this Christmas, walk over and kneel at the tree. I'm guest-posting over at Nap Time Creations today. Well it's that time of year again! Sing it with me! It's the most wonderful time... of the year! If you were with me last year, you may remember my Inspired Noel series. You may find some of these posts worth reviewing again this year. 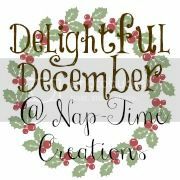 This year, I'm excited to be a part of Emily's (naptime creations) Delightful December series. . . going on all month long! As you can see, I'll be guest-posting on December 4th. I hope you'll stop by to see what I'm sharing and be sure to check in all month long to see the merry crafts, yummy recipes and other jolly fun the other bloggers will be sharing! In the meantime, we're taking a road trip to see my sweet new niece! ...and take a much needed vacation! I'll be sharing a few scenes of the season along the way.